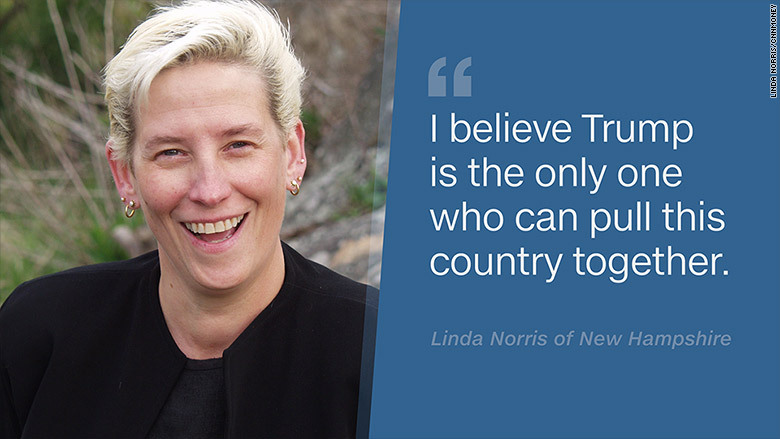 Linda Norris is banking on Donald Trump to improve her life. She voted for him in the New Hampshire primary in February, helping him secure a decisive win. She signed up to volunteer for his campaign. And last week, she sent him a copy of her resume. "I have no way to recover from this horrible economy. 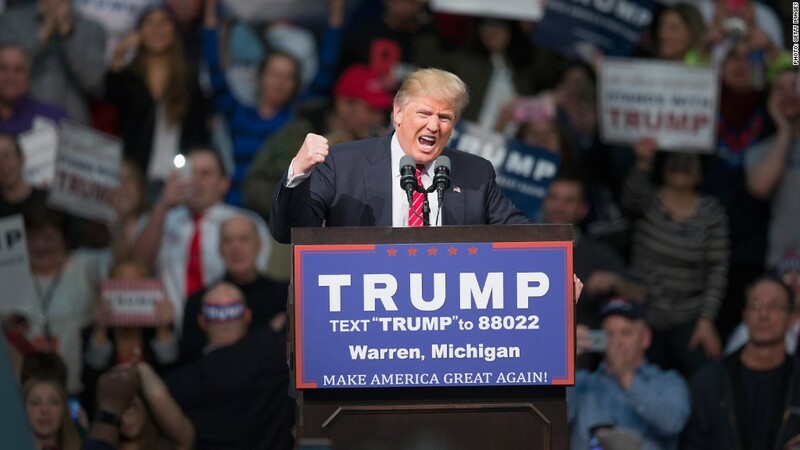 I am voting for Mr. Trump because I have no other choice," she told CNNMoney. Norris is in her early 50s. She spent most of her career building ships and gadgets for the U.S. military. In June, she lost her job at a defense contractor. Funding for the Littoral Combat Ship project she was working on was slashed. She went from earning over $100,000 to nothing. Why not send a resume to Trump, she thought. "I know that some of Trump's statements are outrageous," Norris says. "But this country needs someone who knows how to run a successful business, not a long-term politician." Trump hasn't contacted her yet, but a Trump presidency would likely help her industry. At the CNN Town Hall Tuesday, Trump vowed to beef up the U.S. military, which likely means more defense spending. "If I get in, our military will be bigger, better, stronger than ever before. It's the cheapest thing we can do," he said. Norris has only had three interviews since she lost her job last summer. She attends a weekly meeting with other unemployed workers. She often sees the same people, mostly software and networking engineers. All were middle class. All are in shock about being jobless with so few prospects. Norris seems to be in exactly the spot that many Americans fear -- that they are just one step away from financial ruin. Voters continue to say the economy is their top concern, even though unemployment is low and the country is growing. Americans are advised to study hard and go to college. Norris did that. She earned a college degree in science. She went into the engineering field, steadily moving up in responsibility and pay. For many years she worked as an independent contractor before being hired full-time. She saved up with the hope of buying a home. Then her plan was derailed. Between health issues and losing her job at General Electric (GE) in 2013, she ran her savings down. Then her 401(k). "You think you're OK and you get your nest egg started and then it's gone," Norris said, citing car payments, COBRA, rent and unexpected medical bills from a surgery that didn't go as planned. At the end of 2014, she landed the job working on the ship. It seemed like a godsend, but it lasted only a few months. She doesn't have much savings left. Now she's effectively homeless. She lives with a friend because she can no longer pay rent on her own. Norris applies for any job, including those at the mall. Her advice to younger Americans is to study multiple subjects in college and plan for a backup career -- something like hairdressing that can't be outsourced or cut by Congress. Trump employs about 22,450 workers in his organization, according to an estimate by PrivCo, which tracks private companies. The Trump campaign did not respond to a request for comment on Norris' resume or volunteer work for the campaign. The message from this engineer to Trump? "I am eight months unemployed. I hope you are my knight in shining armor. I hate $0 income," says Norris.